1 About three-quarters of U.S. adults (77%) say they own a smartphone, up from 35% in 2011, making the smartphone one of the most quickly adopted consumer technologies in recent history. Smartphone ownership is more common among those who are younger or more affluent. For example, 92% of 18- to 29-year-olds say they own a smartphone, compared with 42% of those who are ages 65 and older. Still, adoption rates have risen rapidly among older and lower-income Americans in recent years. From 2013 to 2016, the share of adults 65 and older who report owning a smartphone has risen 24 percentage points (from 18% to 42%). There has also been a 12-point increase in smartphone ownership among households earning less than $30,000 per year: 64% of these lower-income Americans now own a smartphone. 2Half of younger adults live in a household with three or more smartphones. More than nine-in-ten 18- to 29-year-olds (96%) say they live in a household with at least one smartphone, and 51% of young adults say their home contains three or more such devices. Still, many older adults also live in households with multiple smartphones. For example, 39% of 30- to 49-year-olds and 29% of 50- to 64-year-olds say their home contains three or more smartphones. This is far less common, however, among those 65 and older, with just 11% saying it applies to their household. 3Mobile devices aren’t just for calling or texting. Americans are using their phones for a variety of nontraditional phone activities, such as looking for a job, finding a date or reading a book. Some 28% of U.S. adults said in a 2015 Pew Research Center survey that they have used a smartphone as part of a job search. This is especially common among younger adults, with 53% of 18- to 29-year-olds reporting doing this. Other Pew Research Center data show that 9% of U.S. adults say they have used mobile dating apps, while the share of Americans who say they read an e-book using a cellphone within the past year increased from 5% in 2011 to 13% in 2016. 4The smartphone is becoming an important tool for shoppers. While around half of U.S. adults (51%) report making online purchases via their smartphone, many are also turning to their phones while in a physical store. In a 2015 Pew Research Center survey, 59% of U.S. adults say that they have used their cellphone to call or text someone while inside a store to discuss purchases they are thinking of making. Just under half (45%) have used their phones while inside a store to look up online reviews or to try and find a better price online for something they are thinking of purchasing. And a relatively small share of Americans (12%) have used their cellphones to physically pay for in-store purchases. 5 Growing shares of Americans – especially those who are lower-income – rely on smartphones to access the internet. Overall, 12% of U.S. adults were “smartphone-only” internet users in 2016 – meaning they owned a smartphone but did not have broadband internet at home. This represents an increase from 8% in 2013. Reliance on smartphones to go online varies greatly by income. 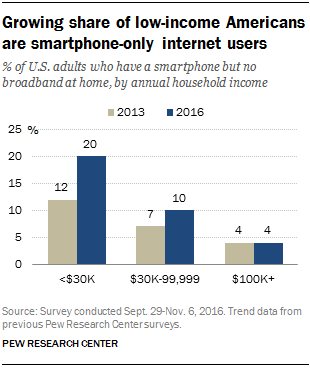 One-in-five adults whose annual household income falls below $30,000 are smartphone-only internet users, compared with only 4% of those living in households earning $100,000 or more. 6More than half of smartphone owners say they get news alerts on their phones, but few get these alerts frequently. Some 55% of smartphone owners say they ever get news alerts on their phones’ screens, according to a 2016 Pew Research Center survey. However, few users say they receive these types of alerts often, with just 13% of smartphone owners reporting doing this. 7 While smartphones are becoming more integrated into our lives, many users aren’t taking the necessary steps to secure their devices. A 2016 Pew Research Center survey found that 28% of U.S. smartphone owners say they do not use a screen lock or other features to secure their phone. Although a majority of smartphone users say they have updated their phone’s apps or operating system, around four-in-ten say they only update when it’s convenient for them. But some smartphone users forgo updating their phones altogether: 14% say they never update their phone’s operating system, while 10% say they don’t update the apps on their phone. 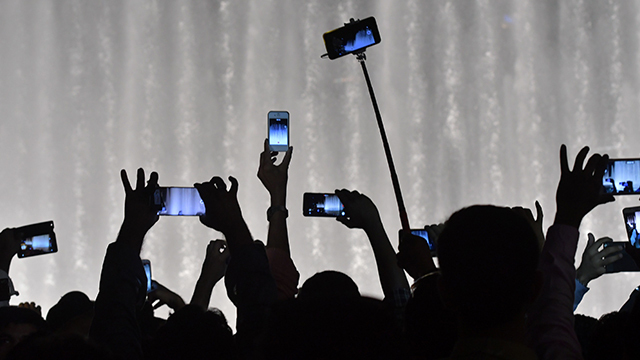 8Smartphone ownership is climbing in developing nations, but the digital divide remains. 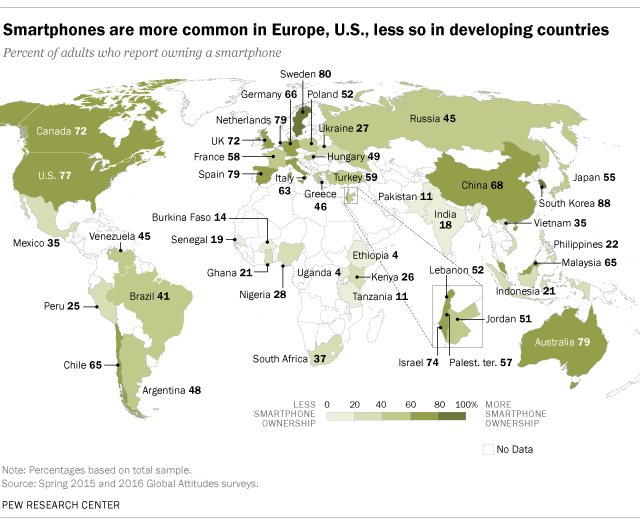 Median smartphone adoption in developing nations rose to 37% in 2015, up from 21% in 2013, according to a Pew Research Center survey of 21 emerging and developing nations conducted in 2015. But advanced economies still have considerably higher rates of smartphone adoption, with the highest rates among surveyed countries found in South Korea, Sweden, Australia, the Netherlands and Spain. Around the globe – including in advanced economies – a digital divide in smartphone ownership still exists between the young and old, and between more educated and less educated people. 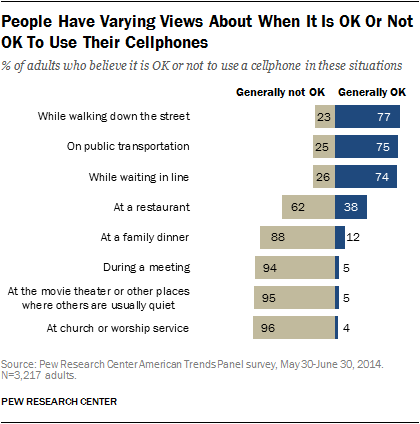 9 Americans have different views about where it is and isn’t appropriate to use a cellphone. In a 2014 Pew Research Center survey, roughly three-quarters of adults said it was OK for people to use their phones while walking down the street, riding public transit or waiting in line, but far fewer found it acceptable to use cellphones during a meeting, at the movies or in church. Regardless of how they feel about the appropriateness of using a phone in social settings, an overwhelming majority of mobile phone owners (89%) say they did use their phones during their most recent social gathering. 10 The smartphone is essential for many owners, but a slight majority says it’s not always needed. 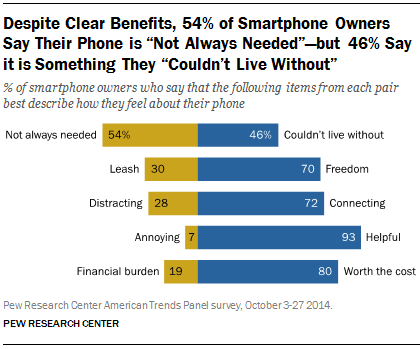 Some 46% of smartphone owners said their smartphone is something “they couldn’t live without,” compared with 54% who said in a 2014 Pew Research Center survey that their phone is “not always needed.” Perhaps surprisingly, smartphone owners who depend on their mobile device for internet access are not significantly more inclined than those who have multiple options for going online to say they couldn’t live without their phone (49% vs. 46%). In addition to being essential for many, smartphone owners are much more likely to have positive views of these devices. For instance, they are much more likely to say smartphones are more helpful than annoying, represent freedom rather than represent a leash, enable connecting rather than being distracting and are worth the cost rather than being a financial burden.